The perfect storm that makes fishing so great in the fall is about to begin. The combination of lower water temperatures, tons of bait and fewer fishermen on the water makes for fantastic conditions. The fact that cooler days will make fishing much more pleasant doesn’t hurt either. Many different approaches will work this time of year and popping corks are a favorite. An angler can catch so many different types of fish: redfish, trout, flounder, ladyfish, shark, etc. I use a weighted popping cork so I can increase the distance of my cast. Then I put an 18- to 24-inch fluorocarbon leader from the cork to a size 1 circle hook. Mud minnows, shrimp and artificial shrimp all work well as baits. When focusing on redfish, we begin to use artificial lures as Fall approaches. Jerk shad lures paired with flutter hooks are my go-to option. Usually 4- to 5-inch length, these lures imitate small baitfish. Flutter hooks have a weight on their shank that produces really great action. Try flutter hooks in size 3/0 with a 1/8-ounce weight and lures in natural hues like silver and grey. For trout, the topwater bite has been very strong first thing in the morning. I’ve tried lots of options but I overwhelmingly use Super Spook Jr’s. My favorite colors are black head/ chartreuse body and silver shad. Alternate your rate of retrieve until you find one that works. Don’t be surprised if every now and then a big redfish takes a swipe. Ladyfish, a personal favorite, are more plentiful than any year I can recall. We’ve spent many charters watching ladyfish blow up balls of bait heading toward the boat. Toss a live mud minnow or shrimp in their path and get ready for some great action. These acrobatic fish are very entertaining as they fly through the air. While these fish will fade as the water cools, we should still have a few more weeks of activity. See you on the water! Capt. Geoff Bennett operates Charleston Charter Fishing providing light tackle and fly fishing charters. 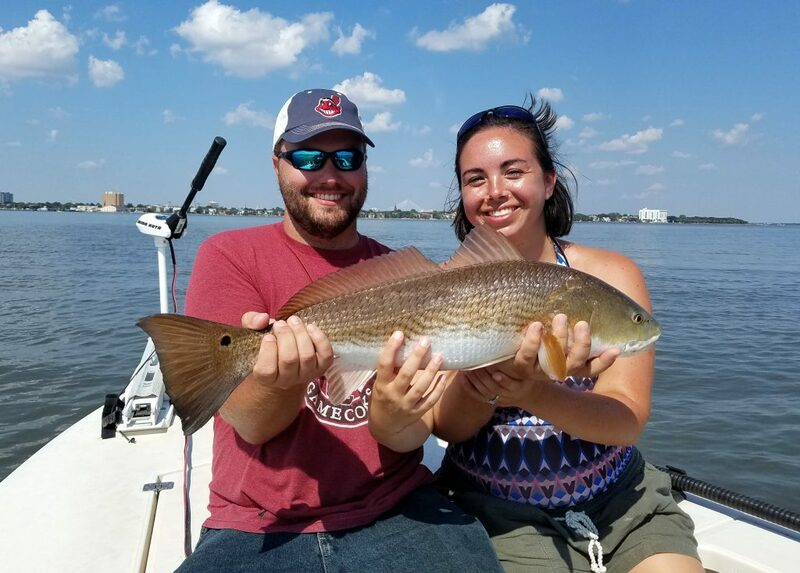 For more information, call 843-324-3332, visit charlestoncharterfishing.com or email captain@charlestoncharterfishing.com.